Clear and create this great new truly inclusive space! Come and help develop studios, exhibition, a dance and music hall. Learn new skills and share what you know. If you loved the Golden Iris Festival… That was just the beginning…! 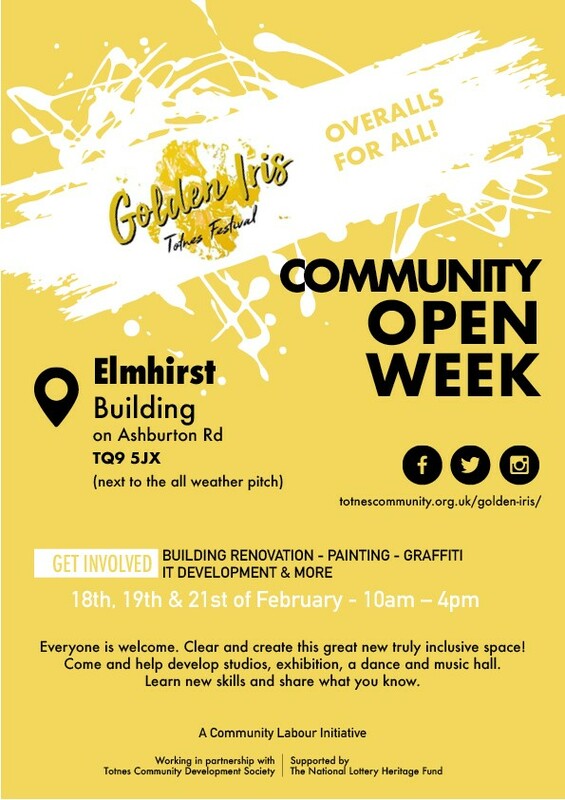 The work on the Elmhirst Building (Ashburton Road, next to the All Weather Pitch) is true manifestation of the desire to make regularly visible common spaces of empathy and support, whilst championing the talents of young people and other volunteers in this community. All are welcome to come by and join in. When: We hope you will be able to drop by for a while on the open days 10am – 4pm Monday, Tuesday and Thursday next week (18th, 19th, 21st February). What: On these days there will be clearing, painting, systems plans (including IT and comms), and renovation tasks. Contractors will be leading skilled sessions and activities will be led as part of the developing Community Labour Initiative supported by the National Lottery Heritage Fund. Please wear sturdy shoes, old but comfortable clothes (so you can roll your sleeves up and join in with practical activities that might take your fancy). If you just want to drop in and show your support and hear more you are very welcome too. To read more about Golden Iris on this website.